Can You Please Explain the Gifts or Signs Given to Christians in Mark Chapter 16:17-18? Kim, that passage is in reference to certain gifts given by the Holy Spirit to believers. But the word “believers” in that verse should have been translated “faithful ones.” The gifts are to God’s servants who know to act on their faith. It’s not merely believers, but “faithers” if I might coin a term. First, the gift of casting out devils. This one truly does require faith, because the devils (demons) are actually more powerful than humans, in general. But God’s faithful servants know to anoint the afflicted individual with the oil of our people (olive oil) and order the demon out in Jesus name. They also know that directly afterwards they need to help fill the person’s soul with God’s Word (in other words, direct them to a good, Bible teaching ministry, or include them in your own if you run one). That way, you neutralize the issue described in Matthew 12:45, in which Christ warned that after casting a demon out of a person, failure to help the person fill the void left by the demon can result in “seven other spirits more wicked than” the original spirit can “enter in and dwell there: and the last state of that man is worse than the first.” In other words, if you cast a demon out of someone through faith, then afterwards, through faith, you need to help that person avoid “re-infection” so to speak. And that can only be done by helping that person fill the void left by the demon with the Holy Spirit of God by teaching them the Bible. I know that’s a lot to take in. But read it over several times if you have to. And of course, look up the verses mentioned. Second, the gift of new tongues. This simply means God makes it easier for His faithful servants to learn new languages so they can communicate with people who might speak a different language. This gift was more important back in the old days when, for example, Jerusalem was a more cosmopolitan city, with some people who spoke the Latin tongue, others who spoke Greek, others who spoke Aramaic, etc. There were lots of languages spoken in a relatively small geographical area. So the apostles and others had to have a working knowledge of just about all of the local languages in order to reach more people with the Gospel message. This gift, of course, relates to the cloven tongue spoken by the apostles on that first Pentecost day after Christ’s ascension, in which people of every nation heard the Gospel preached in their own language. And that very same tongue will return when God’s faithful elect are delivered up to the show trials described in Mark chapter 13, that will be put on by the false Jews and their father the devil when he arrives. Third, the gift of taking up serpents. The third gift, “they shall take up serpents” is an interesting one. It’s euphemistic in nature. We know that “serpents” in the Bible are symbolic of Satan’s antichrist children. God’s faithful elect can handle them, because we know who they are and we know their attributes. Sometimes, through faith, we even manage to lead one or two of them to the Lord. Fourth, the gift of protection from deadly drink. The fourth gift is “if they drink any deadly thing, it shall not hurt them,” which is also euphemistic. It means if you’re one of God’s faithful servants, you can read or hear false doctrine, and it stands out to you like a sore thumb as being false. It won’t shake, affect or otherwise deceive you, because you faithfully study God’s Word and therefore can easily recognize false doctrine for what it is. 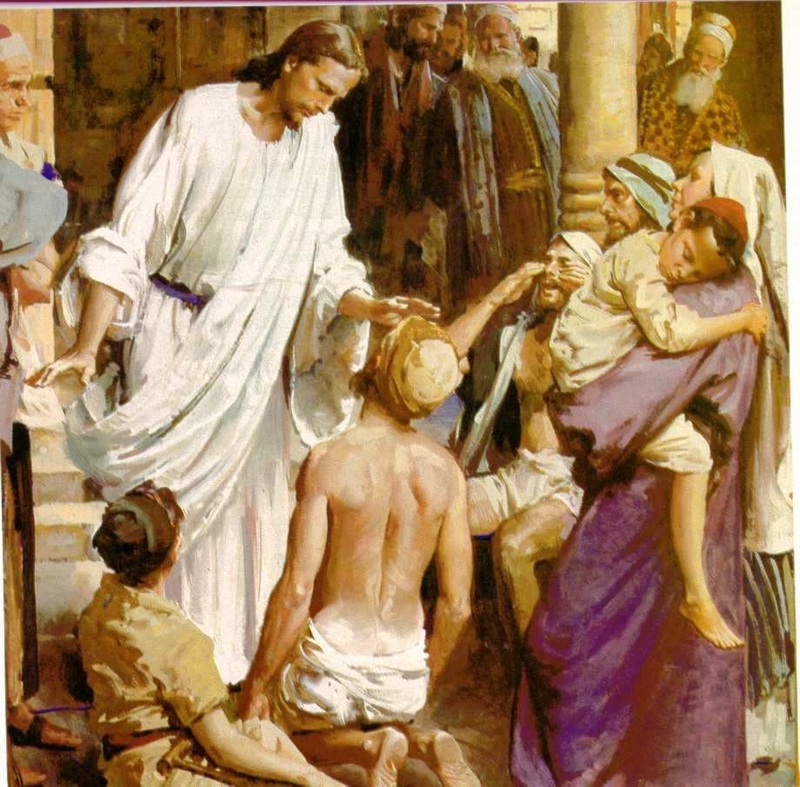 Fifth, the gift of healing by laying hands on the sick. The fifth gift mentioned is “they shall lay hands on the sick, and they shall recover.” That’s simply the gift of healing, as described succinctly but clearly in James 5:13-15. God’s faithful servants can lay hands on the sick (usually in anointing them with the oil of our people) and oftentimes, if the Lord is willing, the sick recover. I’ve seen, for example, a gusher of blood coming out of an individual’s head after suffering a fall, and when a faithful servant of God touched the head wound and ordered the blood to stop, it did. Instantaneously. But yes, it does require faith on behalf of the one doing the laying on of hands.